Famed as one of Scotland’s finest salmon rivers, the 119-mile-long River Tay creates a wildlife haven and adventure playground as it winds its majestic way to the North Sea, where at its widest it carries more water than the Thames and Severn combined. The river defines Perth; a city founded at its historical lowest bridging point until Victorian engineers constructed the infamous Tay Rail Bridge. The location’s strategic importance made Perth a crucial junction of land, sea and river-borne communication. As part of the Tay Cities Deal, a ten-year vision designed to secure £1.83bn in investment and create 15,000 regional jobs, the ambition has always been to realise the full potential of the river. Building on the momentum of recent investments in leisure and recreation infrastructure at the Willowgate Activity Centre, 2017 saw the opening of a completely new marine tourism proposition. Thanks to collaboration between Perth and Kinross Council, the Tay and Earn Trust and Taymara, a voluntary organisation with vessels and qualified crews providing safe access to the River Tay, customers can now enjoy a choice of river cruises connecting the activity centre to Perth city centre and beyond to Dundee. “It’s all part of the River Tay Masterplan,” explains Michael Morgan, Regeneration Project Officer, Perth and Kinross Council. “It helped to identify the vital infrastructure required to improve accessibility to the river. The establishment of the Tay and Earn Trust has given us a mechanism to access grant funding to promote the historical and cultural value of the river. The pontoons – one located close to the Ferguson Gallery in Perth city centre, the second at Willowgate Fisheries – have paved the way for the launch of river cruise services, running from June to the end of October. Two vessels, a small river cruiser and a RIB boat, provide a Friday-Sunday weekend service between the two pontoons. For wildlife fans, an early morning or early evening cruise from the city centre downriver to view Kinnoull Hill provides the perfect start or end to the day. 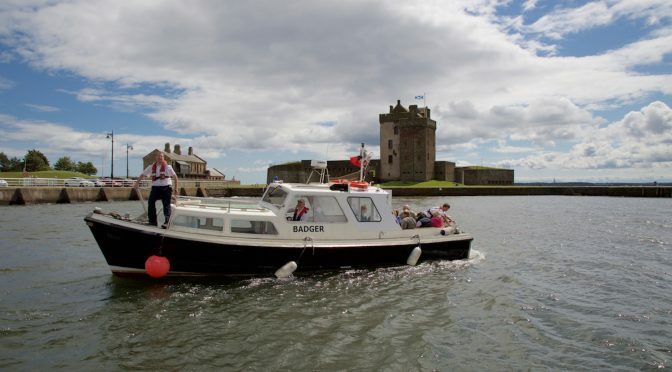 Mid-week, passengers from Willowgate can also catch the Missel Thrush, a 1960s-built Fleur de Lys Class motor cruiser for an evening sail to Elcho Castle.